On November 1, 2018, CMS released the CY 2019 Quality Payment Program final rule under the MACRA (Medicare Access and CHIP Reauthorization Act of 2015) law. You can find the Fact Sheet here and an Executive Summary here. Payment adjustment for the 2021 payment year ranges from - 7% to + (7% x scaling factor) as required by law. (The scaling factor is determined in a way so that budget neutrality is achieved.). 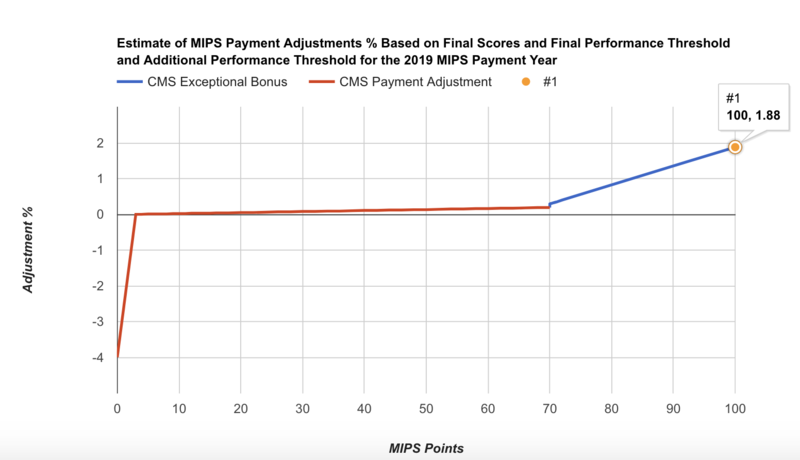 The maximum bonus is estimated by CMS to be 4.69% for clinicians that reach a MIPS score of 100 on 2019 MIPS reporting. Performance threshold increases to 30 points for 2019 MIPS (instead of 15 in 2018). Additional performance threshold increases to 75 points for exceptional performance for 2019 MIPS. In the 2021 MIPS payment year, MIPS payment adjustments, which only apply to covered professional services (and does not includes Part B drugs), will be applied based on MIPS eligible clinicians’ performance on specified measures and activities within four integrated performance categories. CMS estimates that MIPS payment adjustments will be approximately equally distributed between negative MIPS payment adjustments ($390 million) and positive MIPS payment adjustments ($390 million) to MIPS eligible clinicians, as required by the statute to ensure budget neutrality. Positive MIPS payment adjustments will also include up to an additional $500 million for exceptional performance to MIPS eligible clinicians whose final score meets or exceeds the exceptional performance threshold of 75 points. CMS estimates that 91.2% of MIPS eligible clinicians that participate in MIPS are expected to receive positive or neutral payment adjustments. More MIPS eligible clinicians above the performance threshold means the scaling factors would decrease because more MIPS eligible clinicians receive a positive MIPS payment adjustment factor. More MIPS eligible clinicians below the performance threshold means the scaling factors would increase because more MIPS eligible clinicians would receive a negative MIPS payment adjustment factor and relatively fewer MIPS eligible clinicians would receive a positive MIPS payment adjustment factor. A second 12-month segment beginning on October 1, 2018 to September 30, 2019. It is important to note that if a TIN or TIN/NPI did not exist in the first segment, but does exist in the second segment, these eligible clinicians could be eligible for MIPS. For example, the eligible clinician may not find their TIN or TIN/NPI in the Quality Payment Program lookup tool but may still be eligible if they exceed the low-volume threshold in the second segment. Starting in 2019, clinicians or groups will be able to opt-in to MIPS if they meet or exceed at least 1, but not all three, of the low-volume threshold criterion. For individual eligible clinicians and groups to make an election to opt-in or voluntarily report to MIPS, they would make an election via the Quality Payment Program portal by logging into their account and simply selecting either the option to opt-in (positive, neutral, or negative MIPS adjustment) or to remain excluded and voluntarily report (no MIPS adjustment). Once the clinician or group elects to opt-in to MIPS, the decision is irrevocable and cannot be changed for the applicable performance period. Clinicians who do not decide to opt-in to MIPS would remain excluded and may choose to voluntarily report. Such clinicians would not receive a MIPS payment adjustment factor. CMS has developed a website that provides design examples of the different approaches to MIPS participation in CY 2019. The website uses wireframe (schematic) drawings to illustrate the three different approaches to MIPS participation: voluntary reporting to MIPS, opt-in reporting to MIPS, and required to participate in MIPS. Individual eligible clinicians and groups opting-in to participate in MIPS would be considered MIPS eligible clinicians, and therefore subject to the MIPS payment adjustment factor. Individual eligible clinicians and groups voluntarily reporting measures and activities for the MIPS are not considered MIPS eligible clinicians, and therefore not subject to the MIPS payment adjustment factor. Quality: 12-month calendar year performance period. Cost: 12-month calendar year performance period. Promoting Interoperability: 90 days minimum performance period. Improvement Activities: 90 days minimum performance period. Weight to final score: 45% (instead of 50% in 2018). Data completeness: completeness threshold is 60% (same as 2018) of eligible cases over the entire year, regardless of payer. Measures that do not meet data completeness criteria will get 1 point instead of 3 points. Small practices (15 or less in the TIN) will continue to get 3 points. Scoring: Maintains 3-point floor for measures scored against a benchmark. Maintains 3 points for measures that don’t have a benchmark or don’t meet case minimum requirement. Measures that do not meet data completeness requirements will get 1 point instead of 3 points, except that small practices will continue to get 3 points. Improvement Scoring for Quality: Improvement scoring will be based on the rate of improvement so that higher improvement will result in more points, particularly for those improving from lower performance in the transition year. Improvement is measured at the Quality performance category level. Up to 10 percentage points available in the Quality performance category. High priority measures will include quality measures that relate to opioids. No high priority measure bonus points for CMS Web Interface reporters. Submitter type is the MIPS eligible clinician, group, or third party intermediary acting on behalf of a MIPS eligible clinician or group, as applicable, that submits data on measures and activities under MIPS. Direct: allows users to transmit data through a computer-to-computer interaction, such as an API. Log in and upload: allows users to upload and submit data in the form and manner specified by CMS with a set of authenticated credentials. Log in and attest: allows users to manually attest that certain measures and activities were performed in the form and manner specified by CMS with a set of authenticated credentials. Medicare Part B claims: only available to MIPS eligible clinicians in small practices (15 or fewer in the TIN) beginning in 2019. CMS wants to move away from claims reporting, since approximately 69 percent of the Medicare Part B claims measures are topped out. In 2019, individual eligible clinicians would be able to submit a single measure via multiple collection types (e.g. MIPS CQM, eCQM, QCDR measures and Medicare Part B claims measures) and be scored on the data submission with the greatest number of measure achievement points. Topped out measures: final determination of which measure benchmarks are subject to the topped out cap would not be available until the 2019 MIPS Quality Benchmarks’ file is released in late 2018. No change in the number of activities that MIPS eligible clinicians have to report to reach a total of 40 points. CMS is proposing more activities to choose from and changes to existing activities for the Inventory. MIPS eligible clinicians in small practices and practices in a rural areas will keep reporting on no more than 2 medium or 1 high-weighted activity to reach the highest score. For group participation, only 1 MIPS eligible clinician in a TIN has to perform the Improvement Activity for the TIN to get credit. CMS will require MIPS eligible clinicians to use 2015 Edition certified EHR technology beginning with the 2019 MIPS performance period. One of the major improvements of the 2015 Edition is the Application Programming Interface (API) functionality. The API functionality supports health care providers and patient electronic access to health information. The 2015 Edition also includes a requirement that products must be able to export data from one patient, a set of patients, or a subset of patients, which is responsive to health care provider feedback that their data is unable to carry over from a previous EHR. In the 2015 Edition, the health care provider has the autonomy to export data themselves without intervention by their vendor, resulting in increased interoperability and data exchange in the 2015 Edition. Each measure would be scored based on the MIPS eligible clinician’s performance for that measure, based on the submission of a numerator and denominator, except for the measures associated with the Public Health and Clinical Data Exchange objective, which require “yes or no” submissions. Each measure would contribute to the MIPS eligible clinician’s total Promoting Interoperability performance category score. The scores for each of the individual measures would be added together to calculate the Promoting Interoperability performance category score of up to 100 possible points for each MIPS eligible clinician. In general, the Promoting Interoperability performance category score makes up 25 percent of the MIPS final score. If a MIPS eligible clinician fails to report on a required measure or claim an exclusion for a required measure if applicable, the clinician would receive a total score of zero for the Promoting Interoperability performance category. Security Risk Analysis remains part of the requirements for the Promoting Interoperability performance category, but would no longer be scored as a measure. Continues exclusions for the EPrescribing and Health Information Exchange Measures. For small practices (15 or fewer clinicians), adds a new category of hardship exceptions to re-weight Advancing Care Information performance category to 0 and reallocate the Advancing Care Information performance category weight of 25% to the Quality performance category. Reweighting extends to additional clinician types (physical therapists, occupational therapists, speech-language pathologists, audiologists, clinical psychologists and registered dietitians and nutrition professionals). New decertification exception for eligible clinicians whose EHR was decertified, retroactively effective to performance periods in 2017. CMS is including the Medicare Spending per Beneficiary (MSPB) and total per capita cost measures to calculate your Cost performance category score for the 2019 MIPS performance period. Case minimum of 35 for the MSPB measure and 20 for the total per capita cost measure. CMS will calculate cost measure performance; no action is required from clinicians. CMS estimate that between 165,000 and 220,000 clinicians will become Qualifying APM Participants (QP). As a QP, an eligible clinician is exempt from the MIPS reporting requirements and payment adjustment, and qualifies for a lump sum incentive payment based on 5 percent of their aggregate payment amounts for covered professional services for the prior year. CMS estimates that the total lump sum APM incentive payments will be approximately $600-800 million for the 2021 Quality Payment Program payment year. Offering the Virtual Groups participation option. The 2019 rule offers again Virtual Group participation, which is another way clinicians can elect to participate in MIPS. Non-Patient Facing: There is no change in how CMS is defining non-patient facing clinicians (Individual’s ≤100 patient facing encounters. Groups: > 75% NPIs billing under the group’s TIN during a performance period are labeled as non-patient facing.) however; CMS is using the same definition for Virtual Groups. Virtual Groups: > 75% NPIs within a Virtual Group during a performance period are labeled as non-patient facing. Complex Patients Bonus: Apply an adjustment of up to 5 bonus points by adding the average Hierarchical Conditions Category (HCC) risk score to the final score. Generally, this will award between 1 to 5 points to clinicians based on the medical complexity of the patients they see. The small practice bonus is increased to 6 points and will now be added to the Quality performance category, rather than in the MIPS final score calculation. CMS will automatically reweight the Quality, Improvement Activities, Cost and Promoting Interoperability performance categories for MIPS eligible clinicians who are affected by extreme and uncontrollable circumstances affecting entire regions or locales.